This very short hike starting from across the Prudence Island Fire Station leads you to the top of a hill with a scenic view of the East Passage and nearby Dyer Island. At the top of the hill is also a picnic bench which makes this spot a good location for a break from a busy day of hiking. 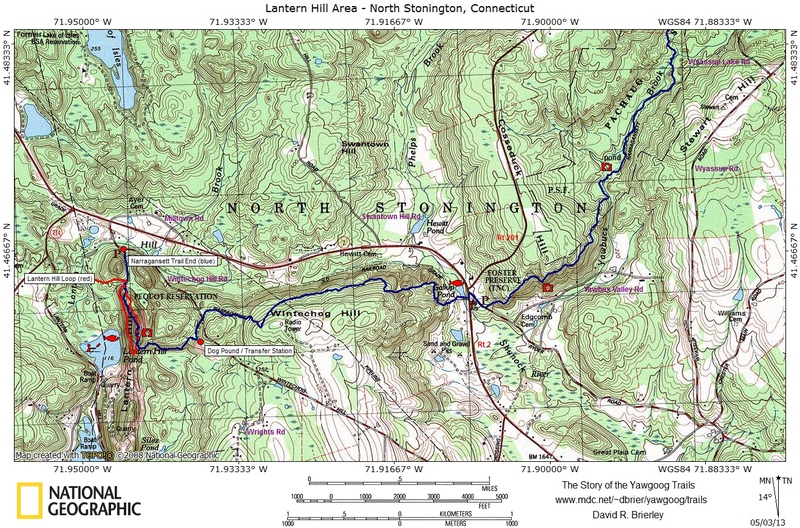 Trail map can be found at: Crows Nest. The largest park in the city of Central Falls offers a little less than a half mile of walking paths and a playground. The park adjacent to City Hall also has significant history and a tower that offers views of the surrounding area. The property is where Native Americans, up upon Dexter’s Ledge, first spotted a company of colonist soldiers during the King Phillips War in 1676. An ensuing battle took place nearby on the banks of the Blackstone River. During the battle a group of soldiers were taken prisoner and killed at Nine Men’s Misery in nearby Cumberland. The land that the park currently sits on was donated in 1890 and in 1904 Cogswell Tower was built upon Dexter’s Ledge. The tower is 70 feet tall and is the highest point in Central Falls. From the tower you see west to the Lincoln Highlands and south to Downtown Providence. Inside the tower is a winding wooden stairway that brings you to a platform just under the clock. Below the tower is one of Rhode Islands best kept secrets. In a vaulted chamber there is a grotto that sits under the tower. The walls are the sides of Dexter’s Ledge and the brick ceiling serves as the base of the tower. Tours are offered occasionally by the City of Central Falls. A fellow hiker, and birder, led this hike for a small group up to Shining Rock in the Richard T. Larkin Conservation Area. The trail-head is just north of the house across the street from the parking area. Parking is available directly across the street from 373 School Street. The trail immediately starts to climb upward along a rocky dirt path under a canopy of beech, pines, oaks, and maples. Along this path on the left is an area that has been quarried. The drill holes are quite evident along the obvious man-made cuts. The trail splits ahead and we stayed to the right. The trail is slightly washed out in areas and could be challenging during rain events. At the next intersection we turned right passing a small cave on the left before coming to another split. Here we stayed to the right descending quickly down a few rocks before climbing back up to the trails end at the Shining Rock overlook. From here you have a sweeping view of the Blackstone River Valley below. The local teens have used the rock as an artistic canvass with some rather respectable graffiti, mostly being that of environmental concerns like “Save the Bees”. Be sure not to get too close to the edge as the rock towers over the pine forest below. From here we followed a trail westerly along the ridge of the rock downhill until we reached the trail we came in on. From here we retraced our steps back to the car. Along this hike we heard the songs of an indigo bunting, as well as oven birds, an osprey, a red belly woodpecker. The birds we saw up close were robins, a tanager. An eagle and its eaglets were observed in the distance from the overlook.